The 3rd KONDO LAND Multi-Legged Robot Obstacle Race took place at ROBOSPOT in Akihabara, Tokyo on May 7, 2011. Nine multi-legged robots, such as 4-legged and 6-legged robot joined the race. All multi-legged robots were custom-built robots. Nine robots were Wani-Wani, 4-legged robot by KENTA, Kani-kan, 6-legged robot by KAMIYA, Golden Week, 4-legged robot by TAKAHASHI, Isoko-Rescue, 4-legged robot by KENMOCHI,Chrotan, 4 legged robot by Kupapa, Garutan, 4-legged robot by Kumama, BLACK TIGER L44 by IKETOMU, Metalic-Bio, 6-legged robot by MORINAGA and TUS-G1, 6-legged robot by Tar. Regulations of the Multi-Legged Robot Obstacle Race were as follows. 1) KONDO servos have to be used. 2) There is no limitation of number of axes. 3) Weight of Robot is 3 kg or under. 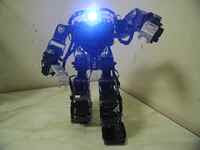 4) Robot body sizes (arms are folding) are height 30 cm, width 30cm and depth 30 cm or under. 5) Moving by wheels is prohibited. 6) Control board is free. 7) Robot has to be controlled by wireless or autonomous. Wired control is prohibited. 1) Obstacles are set in the KONDO CUP KHR Class Soccer Field. 2) The most narrow width of the course is 400 mm and the lowest height of the course is 400 mm. 3) Material of the floor depends on each obstacle. 1) Just one robot walks the course. 2) Time from the start point to goal is recorded. The shortest time robot is winner. 3) Each robot can challenge the course twice. 4) Robot has to reach the goal within 3 mins and the time over robot is retired. 5) Robot gone out of the course gets penalty time 10 seconds and one penalty point. Penalty time adds to the record of 3 minutes. Robot can restart the entrance of un-cleared obstacle. There are no limitations of restart times. Every restart adds 10 sec penalty time and one penalty point. 6) At the 2nd attraction, Magic Wall, robot push out the moving wall has a penalty time 10 seconds and one penalty point. The magic wall push out is not returned to the obstacle. 7) Robot can get points by pushing the button in each point getting place, where a point button set. Getting points are depended on the button set place. A big seesaw, which size are 500 mm in width and 700 mm in length with an inclination of 15 degrees. A point getting push button for one point is set. The steep slope is not easy for every robot. It is important for robot not to slip feet. A road, which size are 600 mm width and 1,000 mm in length with 2 pushing robots. Magic Walll is hard for light weight robots. Robot needs weight and power for push out the Wall. In the 3rd KONDO LAND, push button for stopping pushing robot was set on the each pushing robot. Player robot can stop the pushing robot by pushing the button switch. A big tunnel, which size are 1,200 mm width and 1,200 mm length with a pitfall (400 x 400 mm). Two push buttons for one point are set in the House. Ten point button is set out of the House. One push gets one point and ten times push get 10 points, however 11 times push makes point zero. Robots fallen into the trap, cannot return the race course. Controller cannot see his robot in the Mootan House from controlling space. Controller can move by the advice of his assistant. Robot can be attached wireless camera and be controlled through image on PC. 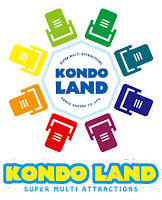 In the 3rd KONDO LAND, robot fallen down under the Mootan House, has to open the gate by pushing button switch set behind the floor in front of Swirling Straits. A Board Bridge, which size are 400 mm width and 700 mm length, revolves on an axis. If robots walk the edge of bridge, robots fall down from the bridge. Robots have to walk slowly in the center of board. Robot needs to have a low gravity. Ten points button is also set beyond the bridge and one point button is set in the slope to the Reverse Street. Robot fallen down from the pitfall of Mootan House, has to pass through the most difficult Swirling Straits. Space of 900 mm width and 1,000 mm length, filled with sponge balls is too hard to walk. Robots need to have long legs. Belt conveyor street of 500 mm width and 700 mm is moving reverse direction. Robot has to walk with high speed. The conveyor is too narrow to walk for big robots. The time record races were carried out twice. In the 3rd KONDO Land Obstacle Race, no robots could clear all 6 attractions even Wobbly Bridge within 3 minutes. Wani-Wani, 4-legged robot by KENTA. Wani-Wani got the special prize, Inoue Prize. Golden Week, 4-legged robot by TAKAHASHI. The 3rd Place. Isoko-Rescue, 4-legged robot by KENMOCHI. The 2nd Place. BLACK TIGER L44, 4-legged robot by IKETOMU. BLACK TIGER L44 got MVP. Presentation of BLACK TIGER L44 motions after competition is here. TUS-G1, 6-legged robot by Tar. 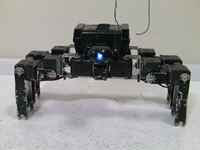 Trial of KMR-6M, a new KONDO 6-legged robot was carried out by a visitor of the 3rd KONDO Land. KMR-6M could clear Mootan House by the beginner. Most of Multi-Legged robots cannot get up from upside-down. Metalic-Bio, Isoko-Rescue and BLACK TIGER L44 could get up from Upside-down. Presentation was carried out after competition. Ramble of multi-legged robot was carried out after competition. Details of the competition were described Sanzai-san`s blog (1) , (2) , (3) (in Japanese). 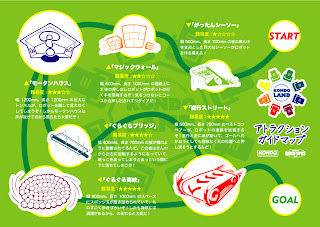 Promotion of the 1st KONDO LAND competition , the 1st KONDO LAND competition and the 2nd KONDO LAND competition were described in this blog.